Fig. 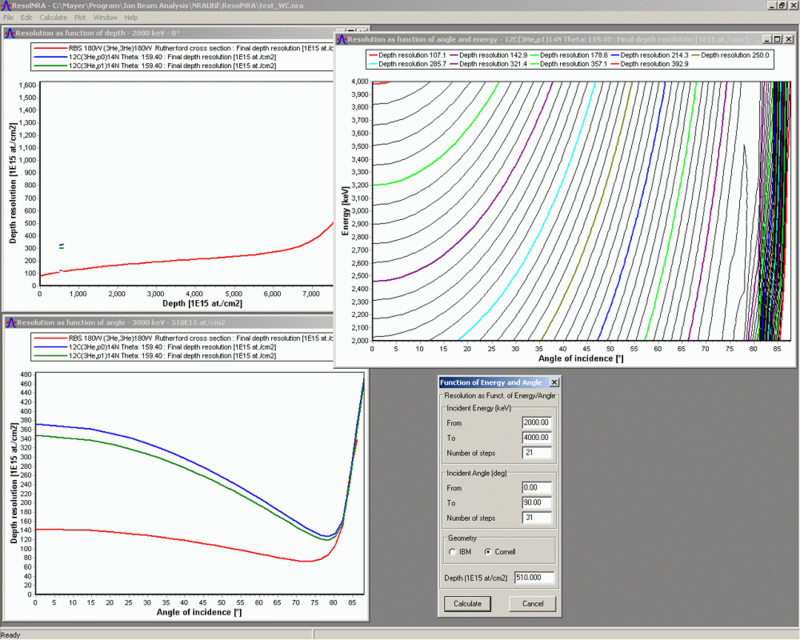 1: RESOLNRA graphical user interface, showing the depth resolution for a thin layer of carbon implanted into a depth of 5x1017 at/cm2 into tungsten. The 12C(3He,p0,1)14N reactions are used for the detection of 12C. The program RESOLNRA performs depth resolution calculations. RESOLNRA allows to find the optimum experimental conditions for ion beam analysis methods, thus enabling optimized measurements. It is also indispensable for the design of new experimental set-up’s. incident energy and incident angle for a specific depth. An example is shown in Fig. 1: It shows the depth resolution for a thin layer of carbon implanted into tungsten. The upper left window shows the depth resolution as a function of depth. The lower left window shows the depth resolution in a depth of 5x1017 at/cm2 as a function of incident angle. The depth resolution in a depth of 5x1017 at/cm2 as function of incident energy and incident angle is shown in the upper right window as contour graph. RESOLNRA is freely available. The current version of RESOLNRA requires SIMNRA 7.0 or higher and is contained in the SIMNRA 7.0 download. Download SIMNRA 7.0.